An upper body oblique portrait of an initiated youth with a rectilinear building in the background. A very similar building can be seen in the background of a portrait [1998.355.9] of a Dok youth, probably taken at Adok in 1936. The lines of initiation scarring are evident on the forehead. The operation (gar) is a severe one which causes much blood loss, across the forehead from ear to ear. Boys were normally initiated between the ages of 14-16, and a group initiated during a number of successive years belong to an age-set (ric). 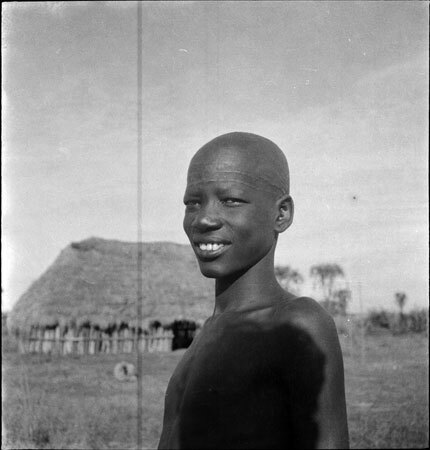 After initation a youth is prohibited from milking, able to marry, gains a spear and an ox from which he takes his ox-name, and was able to go on cattle raids against the Dinka. Morton, Chris. "Portrait of a Nuer youth" Southern Sudan Project (in development). 03 Jan. 2006. Pitt Rivers Museum. <http://southernsudan.prm.ox.ac.uk/details/1998.346.297/>.